Saturday 11th October is the International Day of Action against TTIP! Tomorrow Stop TTIP Mcr members will join with 38 Degrees activists to leaflet and raise awareness about TTIP around Manchester and Stockport. 1. The day will start at 9.45am with a lobby of Gerald Kaufman MP’s regular surgery at St Andrew’s Primary, Broom Avenue, Levenshulme M19 2UH. 3. From 2pm there will also be an info stall aimed at students on Wilmslow Rd in Fallowfield, outside Sainsbury’s if dry and under a bus shelter outside Owen’s Park if wet. Please come and join in with any of these actions if you can! PS If you’re in Bolton there’ll be a family-friendly joint Global Frackdown/StopTTIP meetup on the Town Hall Steps in Victoria Square at 12 noon. 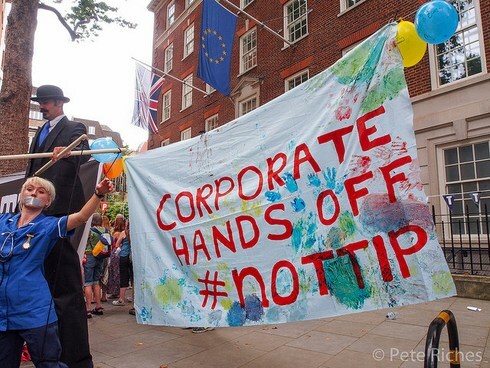 This entry was posted in TTIP, Uncategorized and tagged action day, corporate power, Manchester, TTIP by stopttipmcr. Bookmark the permalink.